So, I had the Apple Watch Series 1, when I purchased mine two years ago it was the only one out. Even after the new ones came out I did not see the reason to upgrade it for my lifestyle. I really did not have any technical problems with my watch the whole time I had it! It worked great! My big issue of it was the look of it. As a blogger, I am constantly taking pictures, and for me seeing my Apple Watch in pictures, it was an eyesore for me! Overall, I think it did what it was supposed to and it was good quality, but it just was not for me based on looks! But, let's get into the pros and cons! - Great for tracking workouts! I loved tracking how many miles and steps I would walk a day. - Easy to change out the band and have a new look. - Newer series have cellular data. You no longer need to have your phone on you to use all the functions of your watch. - The looks, bulky design. - Style options. The face of the Apple Watches is all the same, square. There are only two options to choose from, small or large. The only way to change the look of the watch is to change the band. - Good quality bands are expensive. - Newer models can get very pricey. I have had my Michael Kors Smartwatch for about a month now, and I have waited this long to do this review so that I could really give you guys my full opinion on how it all works! I had been thinking about switching to the Michael Kors watch for a few months before I got mine. I was getting tired of the bulky unattractive look of the Apple Watch and the only thing I was using my Apple Watch for was to check my text messages. Any time I asked anyone about the Michael Kors version all I heard back was that if you own an iPhone you will not be able to answer your text messages on it. I am sure that you can all guess that that was not a deal breaker for me. For some people, it may be! But, what really sold me was how many styles there were and how it looked like a normal watch! So without further ado, let's get into the pros and cons of the Michael Kors Smartwatch. For anyone curious, the one that I have is the Bradshaw! I have it linked with my outfit details underneath the photos and right HERE. - Looks like a normal watch. - Same features for use of working out like the Apple Watch has. - Many different watch styles to choose from to find one that best fits you. - Bands can be changed out. - Links can be taken out of the band to perfectly fit your wrist. - The watch faces are very customizable. All of the colors within a wallpaper can be changed and the widgets can be adjusted to fit your life. - Cannot answer text messages or phone calls directly from the watch. - An android-based system so it sometimes has issues with Apple software. - Battery life does not last as long as the Apple Watch did (lasts about a day and a half, Apple Watch will last you two days). I hope that you guys enjoyed this review and I hoped that it helped you if you have been looking into purchasing one of these watches! At the end of the day, it comes down to what you wanna do with the watch and what look you are going for! 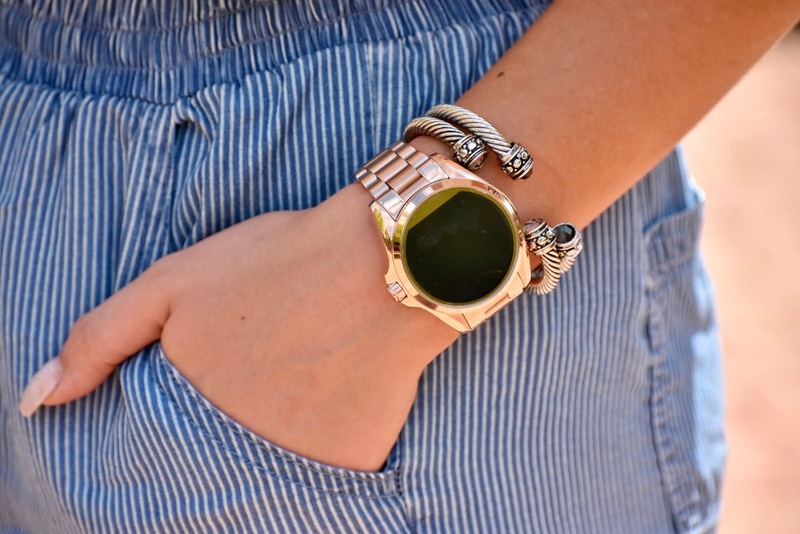 I love accessories and I love how a watch completes a look so the Michael Kors SmartWatch was best for me! If you liked this tech post leave me a comment below and let me know and I will do some more for you guys!